Haters aren’t your problem … ignoring them is. If it feels like there are more complaints than ever, and that you’re spending more time and money dealing with negativity and backlash, you’re right. But the rise of customer complaints is actually an enormous opportunity. In this eye-opening presentation, Jay reveals brand-new, proprietary research into The Science of Complaints. 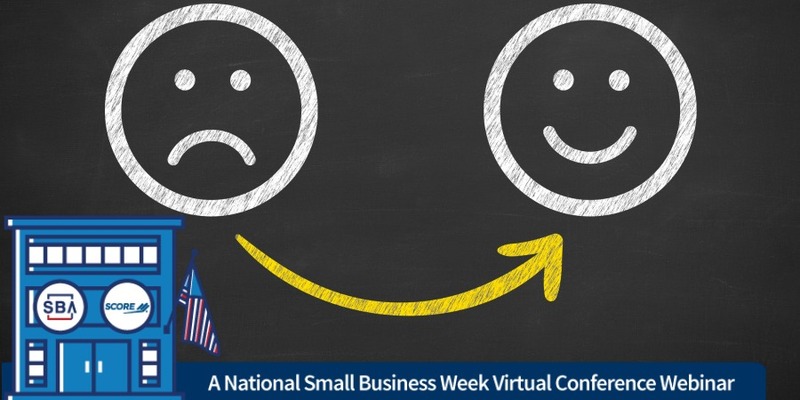 This webinar is a part of the 2018 National Small Business Week Virtual Conference. This website is provided as a public service under Cosponsorship Authorization # SBW2018. It is not an official U.S. government website and may contain links to non-U.S. government information. Inclusion of such links does not constitute or imply an endorsement by SBA. SBA is not responsible for the content, accuracy, relevance, timeliness or completeness of linked information. Please use caution when considering a product, service or opinion offered by a linked website. Chase for Business provides deposit accounts, loans, credit cards, payment processing and cash management to 4 million small businesses across the country and is among the top SBA lenders. Chase extended more than $24 billion in new credit to small businesses in 2016 through Business Banking, Ink from Chase and Commercial Term Lending, part of the Commercial Bank. Jay Baer, a Certified Speaking Professional, has given hundreds of insightful, humorous presentations world-wide to audiences as large as 15,000. He is a renowned business strategist, a New York Times best-selling author of five books and an advisor to more than 700 companies since 1994.